This post was written by Hatchet reporter Janna Paramore. GW maintained its status as the No. 1 college in the nation for internship opportunities for the second year in a row. The Princeton Review ranked 2,000 public and private institutions in a variety of categories to determine the “colleges that pay you back.” While GW didn’t rank high in other categories like graduation rates or alumni salaries, the University has gotten high marks from the organization on city location, politically active students, residence hall quality and study abroad programs. About two-thirds of GW undergraduate students complete internships, according to a University website. 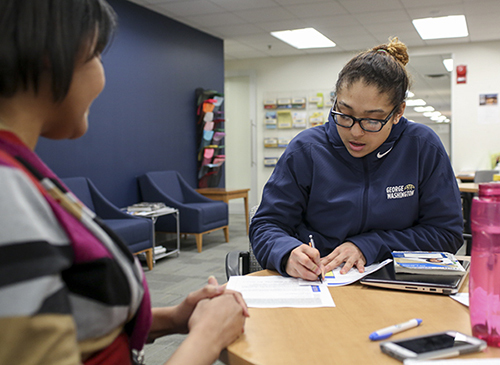 GW slashed tuition fees for students who needed to receive academic credit for internships after former Student Association President Nick Gumas pushed for the change. Students now pay $50 per one credit to receive academic credit for internships, a dramatic drop from the $1,300 students were paying each semester.